Jinglin provides a series of packing machines uniquely designed and manufactured with state-of-the-art technology. 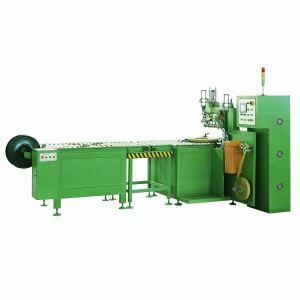 The machines offers various controls for wrapping the stretch film and paper roll at designed wrapping tension and for different wrap configurations. The GD type steel coil wrapping machine designed by Jlpack is specially designed for metallurgic industries, it can be widely used for automatic packing of steel coils, copper coils, aluminum coils, steel wire coils, copper wire coils, cable coils and other coiled objects, to make the product well-protected&sealed, waterproof, dustproof, rustproof, and convenient for transportation. The steel coil packing machine can well improve the packing efficiency and greatly save labor cost. *The steel coil wrapping machine is with top-opening structure which is convenient for loading by crane. *PLC program for automatic control. *Standardized, modular design; stable performance and convenient maintenance. *Humanized structure, ensure safe and convenient operation. *Soft start, soft stop and precise reset of the ring. *The turning ring height is adjustable, to suit for object with different ID and OD. *The rollers are wrapped by PU to protect the products effectively. *Indicator lamp alarms automatically when trouble occurs. *Two kinds of different wrapping material can be wrapped together in one operation. *Different packing material can be used including knit tape, stretch film, compound paper, non-woven fabrics, plastic tape,&etc. Compound knit tape/compound paper, etc. *Expert manufacturer with more than 20 years' experience in the field. *Can provide reliable and high-quality products. *Can provide custom-built machines according to special requirement. *Can provide update and powerful technical support. *Long-term, reliable and friendly partnership.